Special Guest Speaker: Bruce Shwedick, Managing Director, Crocodilian Conservation Center of Florida, Inc. The Tomistoma is a large, slender-snouted crocodilian found in peat swamp forests and in slow moving rivers in Malaysia and Indonesia. The Tomistoma lays the largest eggs of any living crocodilian and feeds on a wide variety of vertebrates, including primates. The unusual crocodilian is threatened in the wild due to agricultural development, primarily related to the expansion of oil palm plantations. 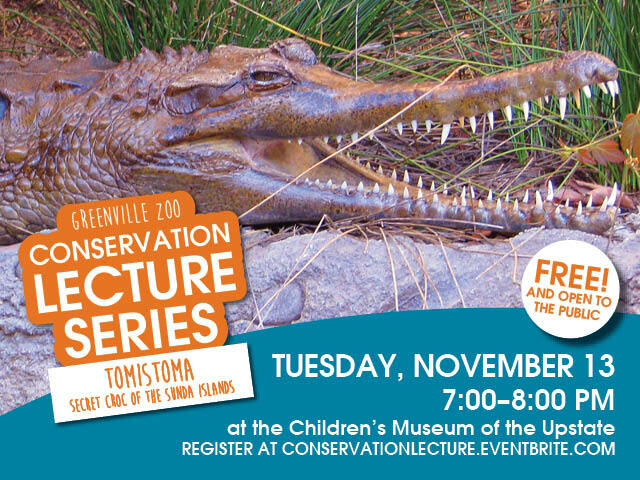 As Chairman of the Tomistoma Task Force within the IUCN-SSC Crocodile Specialist Group, Bruce Shwedick will present information about the natural history of the Tomistoma and highlight their conservation efforts. Adults and children are welcome.